International Cinema Education, Inc. (I.C.E.) began in 2003 at the United Nations as a “Global Classroom” where New York City public high school students were invited each month to a free tour of the United Nations and screening of a foreign film. More than 75 films were shown to 12,000 New York City students from over 100 public high schools. With the help of Ambassadors, U.N. tour guides, actors, directors and producers, these students were transposed to worlds beyond their imagination and learned about countries they never knew existed before. As of September 2008, I.C.E. has taken this global program directly into New York City public high schools and across the United States to public high schools in Oklahoma. We collaborate with liaison teachers who interweave our program into their traditional Social Studies, Global History, English and Film classes, as well as teach the program in newly created elective classes based on this program. 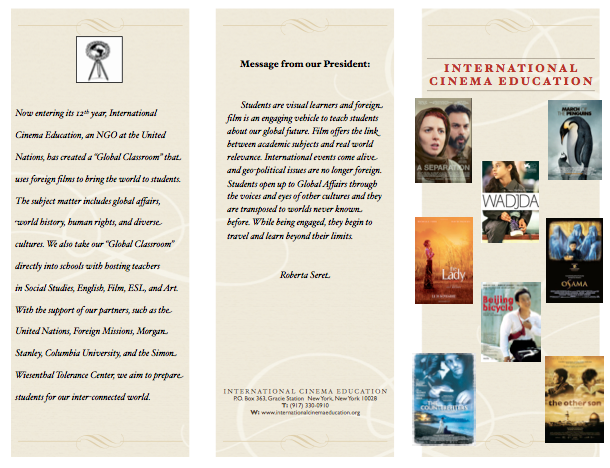 Using I.C.E.’s “multi-disciplinary” pedagogy as a textbook/ curriculum, World Affairs in Foreign Films © (McFarland Publishers, 2011) the teachers screen the film in the classroom and then use the film to catapult lessons in world history, geography, government, finance, creative writing, comparative literature, film, and art. The textbook is used as a vehicle to understand international themes, world affairs and cross cultural concepts. It also represents a contemporary voice of communication in today’s world. World Affairs in Foreign Films helps students understand the connection between film and international events and how both are relevant to their life. The text’s content, activities and assignments add real-world relevance to academic subjects and also satisfy the New York State Regents Requirements, State Requirements in Language Arts, Social Studies, and the Arts. The multi-disciplinary curriculum is unique and engaging for student learners. Members of I.C.E.’s Board of Directors from Morgan Stanley, the United Nations, Wall Street firms, teachers and filmmakers, go to the high school classrooms for post-film discussions. We have created a concept that students in their own classroom have a forum of diplomatic experts and leading professionals to answer their questions and prepare them to understand our global world. In this format, international events come alive and world issues are no longer foreign. Students become engaged and curious and begin to see the world with a new openness of mind. The Mission of I.C.E. is to teach world events through the medium of film. In addition, we teach students about the global marketplace and international cultural understanding. These goals are achieved with help from our Global partners as the Simon Wiesenthal Tolerance Center, Morgan Stanley, Columbia University and the United Nations. The Tolerance Center invites students to a 2-hour interactive film and computer program to combat racism and intolerance. Morgan Stanley invites the students to their N.Y. City office for a “Global Economics” seminar to learn about micro-financing, emerging markets, and what students should know to better prepare for the global marketplace. Morgan Stanley also offers our students a tour of the New York Stock Exchange. Columbia University’s Teachers College hosts screenings and post Q&A with faculty from FERA (Film Education Research Association). The United Nations’ Foreign Missions also invite our students to briefings at their Missions to learn about foreign countries and their global interaction. In addition, students are invited to the United Nations for tours and première film screenings. Students also have the opportunity to have briefings about the United Nations. Our global program offers high school students an understanding of the World as well as tools to prepare them for college studies and for the global workplace. We help them understand the cultures of different ethnic groups. We advocate group projects, analytical thinking and critical analysis. We also strive to prepare our students to better understand the global future and become citizens and leaders of our merging world. More than 12,000 students have participated in our programs free of charge. 4.Global Economics Through Film, (2009-10). CUNY’s “College Now” Program. 7. Global Voices Through Film, (2008-present) As of September 2008, we have taken our program directly into public high schools. The program consists of lectures and screenings of 10+ films shown in the high school classroom; post Q & A discussions from members of the United Nations and Morgan Stanley volunteers; a tour of the United Nations with private briefings at Foreign Missions; and a workshop at the Tolerance Center about human rights. a. The International Film Festival at the United Nations, (2003-present) Each month we invite 175 New York public high school students from different schools in the five boroughs to participate in this event, beginning with a one-hour tour of the United Nations and followed by a screening of a foreign film and a Q & A discussion where students can ask questions to the actors, directors, producers and Mission delegates from the film’s country of origin. 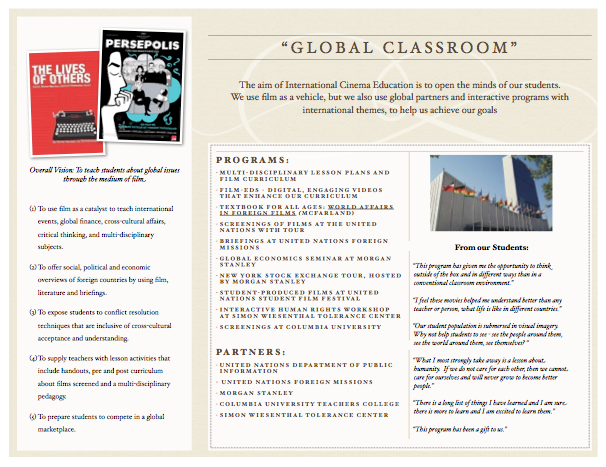 We supply teachers with written literature and handouts for pre and post curriculum about the film, from our textbook, GLOBAL VOICES THROUGH FILM, as well as written information about the United Nations so they can continue their discussion the next day in the classroom. The population served are New York City high school students, 9th, 10th, 11th and 12th graders. As of date we have had more than 8,000 students from 100 public high schools attend our events. All programs are free to students and schools. The United Nation’s Tour Desk arranges a tailored-made one-hour private tour of the United Nations for the high school students participating in this program. The Foreign Missions of the United Nations have been very committed to participate in this program. They send members of the Mission to answer the students’ questions pro bono in the Q & A session, supply films to facilitate the most appropriate selection, and contribute to the curriculum development with material when available. We have had more than 40 Missions participate in this program. Film companies like Miramax, Fox, Fine Line, Warner and Weinstein Brothers have all offered us with premieres and actors, directors and producers to answer students’ questions. The public schools of New York City and the students have also been supportive of this program by contributing to the transportation costs, be it to rent a bus or to use public transportation. b.Young Filmmakers for Peacemakers (2006-present) Students who take part in the International Cinema Festival are encouraged to apply to I.C.E’.s Young Filmmakers program, which is a two semester course co-taught by Dr. Roberta Seret and representatives from New York University’s Tisch Film studies program and NYU’s Opportunity program. Students learn about the mechanics of filmmaking while expanding their knowledge of the UN’s organizational structure and mission. Their goal is to learn how to use filmmaking as a voice to better their community. In September 2006, we created and implemented this after school program with 10 NYC inner-city 11th graders from 5 NYC public high schools. The 10 students came to the UN twice a week to learn about the UN by receiving free briefings from different UN agencies. They learned how to film from NYU Tisch interns on Saturdays and on Sundays they learned how to edit their film footage at the MNN studios. At the end of the year-after school program in May 2007, 3 of these students received a free summer internship program with the Tribeca Film Festival Arts Summer program; 3 students participated in a media training program with UNICEF; 3 students spent the summer as interns shooting in Europe and Cambodia; and one student filed for a copyright for her screen script. All 10 students have been recruited by NYU Tisch and Opportunity Program with scholarships. c. Annual Student Film Festival (2007-present) NYC public high school students participating in the Young Filmmakers for Peacemakers course presented their PSA’s and documentaries at the United Nations theater where we also showed students’ films from around the world. In May 2007, we showed the 2007 Oscar-winner for Short Narration, West Bank Story, as well documentaries from Iraq made by Iraqi students, and our NYC students’ short narrations. d. Global Cinema: A Window to the World (2008-present) As of September 2008, we have taken our program directly into New York City’s public high schools and across the nation to Oklahoma. The program consists of lectures and screenings of 10 films shown in the high school classroom; post Q & A discussions from members of the United Nations; a tour of the United Nations with private briefings at Foreign Missions; and a workshop at the Simon Wiesenthal Tolerance Center about human rights. – Political, economic, and military events since the 1950s impacting international relations. – Cultural and technological characteristics that link or divide regions. According to the above 6 states’ standards in Language Arts for high school students, the textbook satisfies the 4 major standard divisions of: Literary understandings; Forms of writing; Language skills and conventions; and Media studies. I have categorized these in the text as: World literature; Media studies; Creative writing/Composition; Music; and Art.